In 1946, Red and Lyttle Bridges opened the first BBQ joint in Cleveland County called Dedmond’s Barbecue; located in the old Dedmond’s building on Highway 18. On June 14, 1966 Red Bridges passed away and left his wife Lyttle to run the business. Lyttle worked night and day until she was 80 years old and had to retire. On February 29, 2008 Mrs. Lyttle Bridges passed way. Today, Red and Lyttle’s daughter, Debbie Webb runs the business along with her two children Natalie Ramsey and Chase Webb. 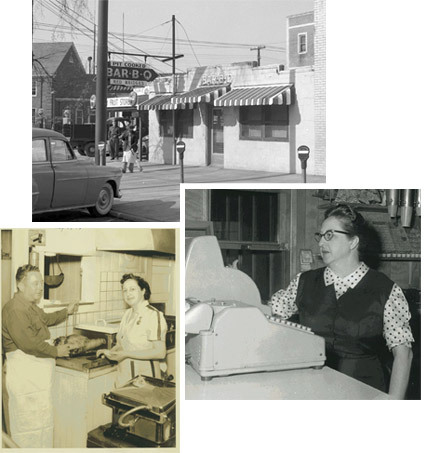 For over 72 years, pit cooked barbecue has been the art of our success. We are one of the only few places left that slow cooks pork over hickory all night long. We feel that this is the only way to get the true old fashion flavor. 72-years down and a lifetime to go!